More than 30 buildings were damaged including Rocket Chevrolet on Ohio 30 and many businesses in that area. Several houses were damaged and about half a dozen injuries were reported. According to AEP, up to 1,200 people were without power after the storm. 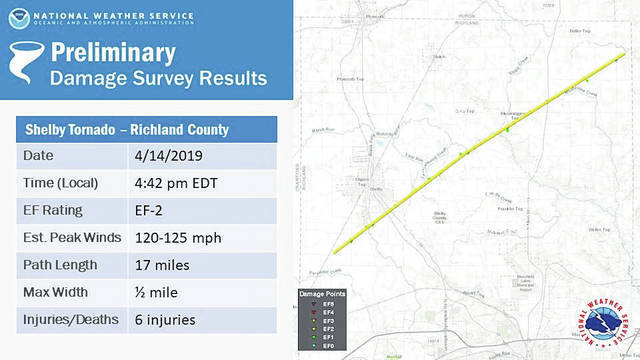 According to the National Weather Service, an F-2 tornado was confirmed in Richland County. Maximum wind speeds were estimated at 120-125 miles per hour, and the tornado’s maximum width was half a mile wide. It traveled about 17 miles Richland County. A Tornado Watch for Crawford was issued Sunday through 9 p.m. About 4 p.m., weather radar indicated a severe thunderstorm near Marion. A Tornado Warning was issued for Crawford County as that storm cell was headed north and east. Tornado sirens were sounded in Galion about 4:30 and about 4:45 clouds in the Galion area darkened quickly. Just a few minutes later, weather radar indicated a tornado near Crestline and a few minutes later news of the damage in Shelby was flooding social media. Sunday’s storm intensified quickly and there were only a few minutes of warning in the Shelby area before the storm hit. Your best remedy against severe weather is to be alert and cognizand of conditions in your area. You can sign up for weather alerts and you can sign up for alerts on your mobile devices. But listen to weather alerts and take action quickly. Severe Thunderstorm Watch: Get prepared. Severe thunderstorms are possible in and near the watch area. The watch area is typically large, covering numerous counties or even states. But be alert and ready to take action should conditions worsen. Severe Thunderstorm Warning: Take Action! Severe weather has been reported by spotters or indicated by radar. Warnings indicate imminent danger to life and property. Take shelter in a substantial building. These warnings typically encompass a much smaller area (around the size of a city or small county) that may be impacted by a large hail or damaging wind. Tornado Watch: A Tornado Watch is issued when weather conditions are favorable for the development of severe thunderstorms capable of producing tornadoes. Tornado Warning: A Tornado Warning is issued by National Weather forecasting agencies to warn the public that severe thunderstorms with tornadoes are imminent or occurring. Funnel clouds can be reported by spotters, law enforcement or indicated by weather radar. The warnings mean those in the warning area should take steps immediately to get to safety. Accu-Weather and the National Weather Service posts watches and warnings immediately to their websites, which can be easily access on mobile phones and through social media. Also, Crawford County residents can sign up for weather alerts by following this link: http://entry.inspironlogistics.com/crawford_co_oh/wens.cfm. Listen to local news or a NOAA Weather Radio to stay updated about severe thunderstorm watches and warnings. In your home, go to your secure location. Take your pets with you if time allows. At work or school, stay away from windows. Do not go to large open rooms such as cafeterias, gymnasiums or auditoriums. If you are outside, go to inside a sturdy building immediately. Sheds and storage facilities are not safe. Taking shelter under a tree can be deadly. Standing under a tree also put you at a greater risk of getting struck by lightning. Being in a vehicle during severe thunderstorms is safer than being outside; however, drive to closest secure shelter if there is sufficient time. Courtesy photo This photo was making its way around social media on Sunday evening after a tornado damaged more than 30 buildings and homes in the Shelby area. Courtesy photo This graphic has been released by the National Weather Service. The EF-2 tornado was a half-mile wide at times and had wind speeds of 120-125 miles per hour. 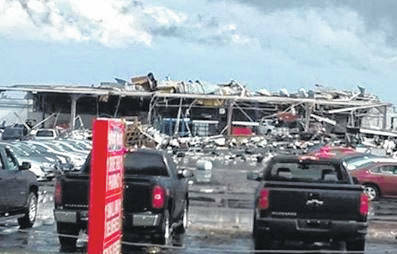 https://www.galioninquirer.com/wp-content/uploads/sites/38/2019/04/web1_Rocket-Chevrolet.jpgCourtesy photo This photo was making its way around social media on Sunday evening after a tornado damaged more than 30 buildings and homes in the Shelby area. Courtesy photo This graphic has been released by the National Weather Service. The EF-2 tornado was a half-mile wide at times and had wind speeds of 120-125 miles per hour.